The Work-Out is a problem solving, change acceleration process which removes BAU organisation bureaucracy. It was named Work-Out because it identified work that should be stopped and removed (out). By bringing the right people together from across GE, the Work-Out lowered resistance to change and generated energy for business transformation. Throughout the 1990s, it was delivered in all of GE’s main businesses, identifying complexity which affected employees, customers and suppliers alike. (Unsurprisingly) CEO sponsorship makes a huge difference. As CEO, Jack Welch made it his personal mission to reduce internal complexity within GE. “For a large organisation to be effective, it must be simple” he claimed. Structural simplification alone does not simplify organisations. 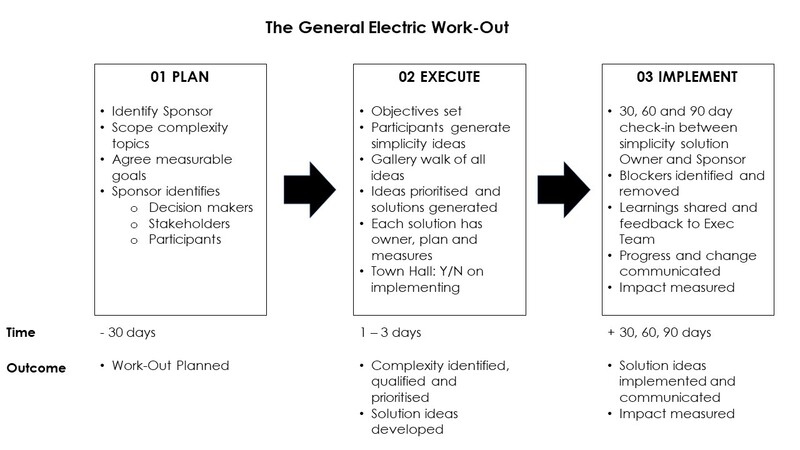 Prior to the launch of the Work-Out, GE had simplified its operating structures. Business units were successfully combined to create a unified organisation. But despite simpler structures, people continued to work in the same way – creating complexity for themselves and each other. Focus simplicity on what happens day-to-day. Complex sign-offs, rules, processes, procedures, management reporting and meetings are what frustrate people, thwart growth and waste time. The more Managers you involve in change, the more impact you make. As obvious as it sounds. Simplicity at the edges doesn’t work. Organisations are too big and prevailing cultures are too strong. To see genuine sustained change, you need to engage a lot of managers in the simplicity process. Bring the right people together. Any level, any role. Everyone should get a voice of where complexity hinders them. Challenge people to create simplicity solutions and publically commit to testing these works. Measurement milestones matter. Putting in 30, 60 and 90 day check-ins creates focus, urgency and momentum. External facilitators make a difference. A small number of consultants ensured a focus on the Work-Out process. Lessons from other parts of GE could be shared. The status quo was challenged and conforming to it was not allowed. Decision-making and implementation can be accelerated. A major success of the Work-Out was deciding on big changes which could be made in just a few days. Change doesn’t have to take months to design and deliver. Mandatory beats voluntary. Welch made it clear that all business units would deploy the Work-Out. Whilst ‘pull’ interventions have a place, simplifying complexity is easy to label as ‘feels too hard’ or like ‘something we should probably do someday’. Reward those who embrace. Have consequences for non-cooperation. Those that could demonstrate improved performance through simplicity flourished. Almost 1/3 of GE employees got stock options through the process. Those who didn’t buy in or actively obstructed left GE. Post Welch, simplicity continues to be a core part of how GE works. Takeaway: GE had the awareness to realise how complexity was hindering performance and the courage to make simplicity a priority. If an organisation as vast and varied as GE can make simplicity a cornerstone of its culture, it’s possible for any organisation to do so. What’s more, GE has made their simplicity blueprint open source for others to implement. Stop. has used the essence of Work-Out in our own client work. Like GE, the outcome is always simpler, smarter teams and organisations, where time is created, money is saved and engagement is increased.